Is paddleboarding your new obsession? If that’s the case or you are just simply looking for a new inflatable board, then we certainly hope you find what you’re looking for. These stand-up boards allow you to go places a regular boat won’t and they give you a clearer sight of the water, but we are aware of how many products exist and these are the best ones. The Sea Eagle FishSUP 126 has a total of 6 inches of thickness and 12,6 x 40 inches when fully inflated. In terms of portability, it’s extremely easy to carry when deflated since it only measures 45 x 15 x 10 inches and it can be rolled to fit in the backpack which is included. This previous feature also makes it a lot easier for storing your board at home and it gives you plenty of room in your car for the rest of your equipment. With this model this will only take 7 minutes to inflate and assemble. Now let’s go over the features, although this is a stand-up model it does come with a swivel seat fish rig; which we truly like because if you’re out for long you can get a bit tired. The board includes two paddles: a SUP paddle and an AB30 paddle. We really like the fact that it includes both of these paddles because it makes this experience a lot more comfortable and easier for you, especially if you are a beginner. It also includes a multi-purpose storage box placed behind the chair for your lures and baits. This item comes with a built-in 36 inches ruler. One more thing, this model comes with 4 rod holders. We think that the feature mentioned above is a great plus for those professionals out there that can handle more than 1 rod at a time. Lastly it has a motor mount appropriate for those of you that don’t like to paddle too much or want to go a bit further. We do have to say that it’s definitely an expensive purchase but it could be the best decision for professionals because of the many features. 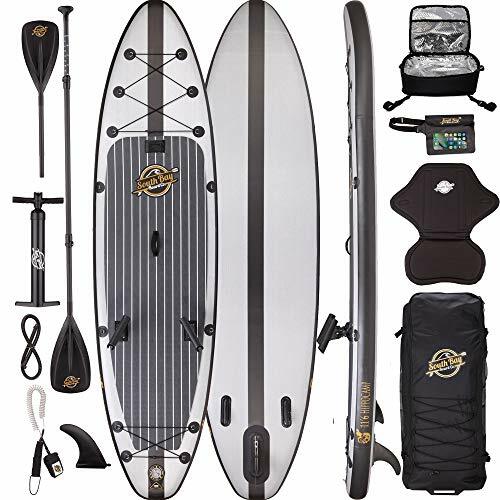 Go check out the Sea Eagle Fish SUP 126 here on Amazon. The Blue Water SUP and kayak is the best option for newcomers in this hobby, measuring 10 x 32 x 6 inches. This board is made from drop stitch with fortified laminated edges which could last you years. 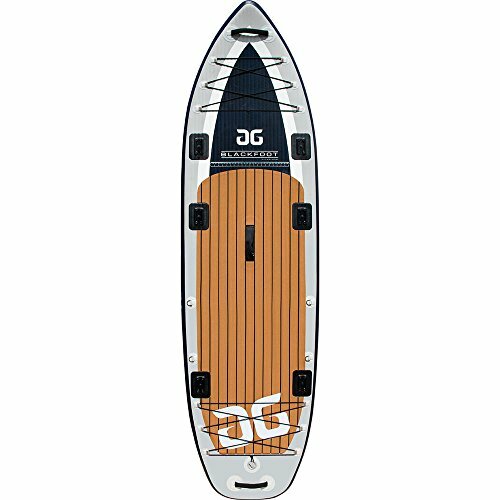 This model has great advantages with one of them being the easy transformation from a stand-up paddleboard to a kayak. This easy-to-do transition only involves the clip-on seat and the 2 in 1 adjustable paddle appropriate for each activity. It also has a footrest which can be removed for a bit more space or for performing different activities. The model offers a wide 32-inch deck which provides greater stability and control. If you’re a bit of an explorer then get this: it comes with its own backpack which means it can be rolled up for fast and easy transport. An additional thing, it comes with a 3 fin set up which improves the maneuverability. A feature we are genuinely fond of is the EVA deck pad which prevents you from slipping and is also comfortable on your feet. For onboard storage, there are 9 D-rings and a military stitch from bungee cord to keep things secure at all time. It takes you a minimum of 12 minutes to get the board inflated with the included high-pressure pump. In terms of value we think this model has a good price considering it’s a 2 in 1 purchase. Get a look at the Blue Water SUP here on Amazon. The Aqua Marina Drift is a stand-up model with a total of 7 D-rings. One placed on the tail to secure the leash, 4 on the nose attached with bungee cord and the other two in the center to maintain the cooler in place. And another thing, the cooler has a chair attached to it for back support. It’s built from double wall drop stitch. It has a large EVA pad to keep you from slipping. It comes with 2 rod holders. The model includes an easy to add fin for better control of the board. An additional thing, it comes with a pump with gauge. The air chambers placed in the center of both sides add extra stability and support to the board. A backpack is included for ease of transportation and storage when deflated. We think this model has an accessible price considering it has plenty of space to keep your catches, we think it’s a great choice for fishing. One last thing we think you should know: this model does not include a paddle. It has a large non-slip pad which gives you a lot of room to walk on. Have a look at the Aqua Marina DRIFT here on Amazon. 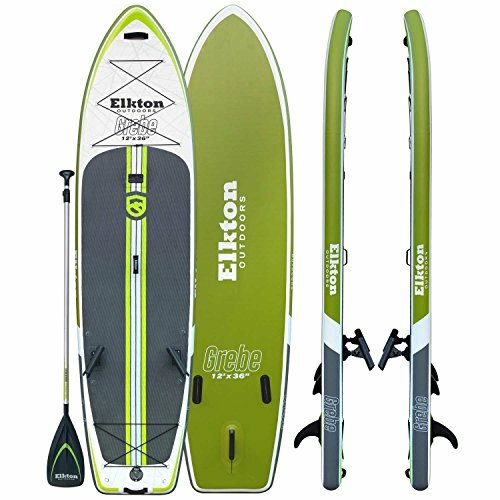 The Elkton Outdoors Grebe is a stand-up board that measures 12 x 36 x 6 inches when fully inflated. For on-board storage it comes with a bungee cord structure placed on both the nose and the tail. It comes with 2 rod holders which can be removed if you just want some paddling time. A high-pressure pump and valve are included for quick and appropriate inflation that lasts the whole day. This model has many features to offer, when the model is completely deflated you can roll it up and secure it with a strap to keep it in place. There is also a backpack with added wheels in which you can store it for fast transportation. An adjustable length paddle is included, this feature is great because you can personalize the length accordingly. It has quite a big EVA pad placed all throughout the center of the board for maximum use of space, which keeps you comfortable and safe. The board includes an ankle leash that can be attached to the paddle to keep it close to you at all times. This product is designed with two built-in fins and it comes with a bigger middle one that can be clipped on. It has heavy duty D-rings that can be used for separately bought Elkton items which could be a plus for fishing. We really like the fact that you can customize this model with a camera, anchor or GPS; these are all great add-ons to get the full experience. In our opinion this model has an accordingly set price if you take in count all the features it comes with and all the options you can add later on. It comes with bungee cords on the front and back which give you more storage space. Check out the Elkton Outdoors Grebe here on Amazon. The Zray Fs7 has the lowest price from the review but varies with multiple features. It comes with a length-adjustable paddle which floats and we consider this a great feature because it makes it a lot more easier if you accidentally drop it. The board is designed with 2 small side fins and one central fin which can be removed when preferred. It comes with Zray’s pump which takes anywhere between 5 to 10 minutes to reach full inflation. When deflated, the model can be rolled up and stored in the included backpack which allows you to carry it freely. The product measures 11 x 32 x 6 inches which makes this model very much suitable for a relaxing fishing trip. It comes with 4 D-rings on where your equipment of preference can be attached. There is an elastic cargo bungee on the nose of the board which can be used as a small storage unit. One last thing, it includes a waterproof phone case which can be used to remember your adventure. 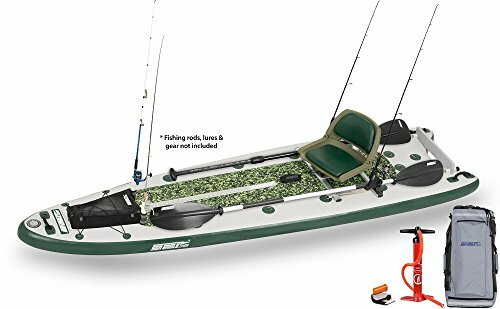 We think this model is a good pick because it has the best price, it could certainly provide you a good day of fishing or kayaking. Take a look at the Zray Fs7 here on Amazon. The SBBC Hippokamp measures 11.6 x 32 x 6 inches. It’s made from a durable drop stitch and it’s covered in military grade PVC layers and carbon fiber rails. It comes with 2 D-rings suitable for a kayaking chair which can be useful when fishing for long hours. It comes with two bungee straps, one on the nose and the other on the tail; this feature allows you to take more equipment if needed. 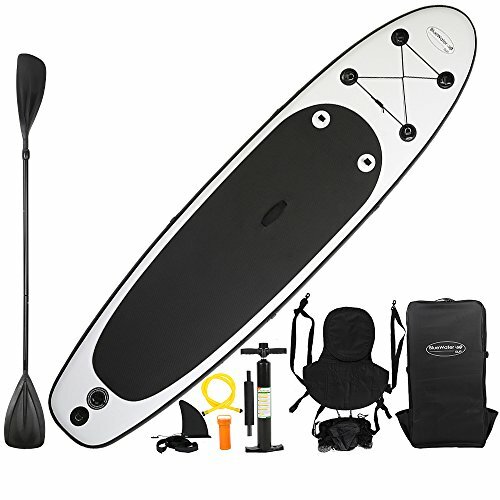 The board includes a 2 in 1 paddle that can be transformed appropriately for paddleboarding or kayaking. One more thing about the paddle: it comes with a leash in order to keep it at sight at all times. An additional detail, it comes with 3 mount locations and 2 built-in fish rod holders. This item comes with 2 smaller fins on the sides and a bigger one for the center, which can be removed. For storage, the board can be rolled up and put in the backpack which comes with wheels in order to make transportation a lot more efficient. We recommend this model for use with your family as it can handle 400 pounds, it can very handy for some bonding time away from technology. We do have to admit that it is a bit expensive but you should look at it as a way of only purchasing one paddleboard for your family. Go look at the SBBC Hippokamp here on Amazon. The Blackfoot Angler can support a total of 450 pounds which is why we recommend it for fishermen with heavy equipment or for those of you that like to paddleboard with company. Its measurements are 11 x 36 x 6 inches and it weighs 28 pounds which is fairly lightweight. The weight of the board makes it suitable for transportation, the backpack that comes with it makes this process even easier. One feature we extremely like is the 6 mounts that are distributed in the most easy-to-access places, you could potentially have 6 rod holders with plenty of activity going on. It also has 4 D-rings which can come in handy for your cooler, these four rings will keep your equipment steady for your convenience. There are two bungee storages located at the nose and tail for more of your essentials. The board is made from premium grade drop stitch with a powerstrip material. The main area of use is coated with an appropriate texture to keep you from slipping. One more thing, it comes with a standard fin that can be easily replaced with one from another brand; this feature could save you time when in need on replacing it. Lastly it has three straps all placed throughout the board evenly to make carrying it quite easy when inflated. 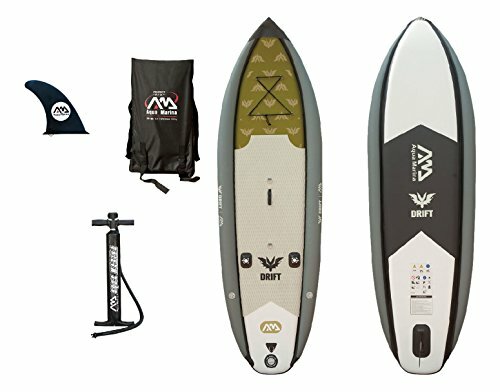 This is one of the highest budget paddleboards from the review but keep in mind it supports the most weight and it has useful features placed throughout the board. Important note: you should know that the paddle isn’t included. Give the Blackfoot Angler a look here on Amazon. If you are a professional fisherman then you should already know the basics of what to look for in a paddle board. Rod holders are extremely important for fishing, as you may know this job (or sport) takes patience and that means time, so you shouldn’t have to be holding your rod manually. And remember the more rod holders the better because that means more possibilities. Bungee storage is common on most paddle boards but you should make sure of this because it can come in very handy to keep your catches or to keep your paddle in place when not in use. D-rings are also quite common but some boards have a few more than other, this feature keeps your equipment in place. This is not a must but if you want to cover more water then this is pretty important because paddling through large areas can be very challenging. In this point we go back to patience, you can’t possibly be standing while some action occurs so a chair (or any kind of back support ) is highly needed. Since all of the products in the review are inflatable, a pump is an essential so make sure it’s included for your convenience. Those are the main points a suitable fishing paddle board should have. The wide teardrop shape gives you a lot of power and speed as soon as the tip touches the water and it has a back angle to keep you in the correct direction. It’s also mostly recommended for when standing up. On the other hand, the narrow teardrop paddle is on both sides of the shaft and it’s appropriate for longer distances and the back angle is smaller. This is suitable for when sitting down. Some of the boards in the review have a 2 in 1 paddle that includes both of these, we recommend a model with this option because they can be quite useful for fishing. How Does Fishing on a SUP Board Compare to Kayak Fishing? We personally prefer SUP board fishing over kayak fishing. You have less storage in comparison to kayaks. One last thing, for SUP boards we do recommend you to pick a model with both a stand-up and seat option. We know that some of these are pretty basic but it takes a lot of consideration when picking these items. We hope this review has helped you choose a fitting paddle board and as we previously recommended go for one that comes with a 2 in 1 paddle. A leash can be very handy to keep yourself or your paddle safe. And lastly your desired fishing rod that should help you make your first catch. Our top choice is the SBBC Hippokamp. This model comes with 2 rod holders and 2 D-rings which are appropriate for a seat. It has bungee storage on the nose and tail. Lastly it comes with its own pump. 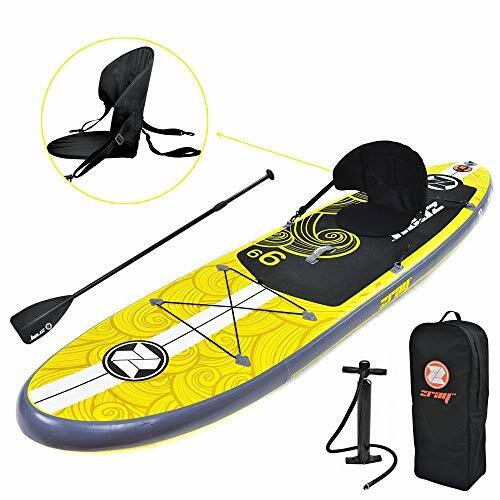 All in all this is our top pick, it comes with practically all the essentials needed for SUP fishing. We hope to have helped you find the most suitable fishing paddle board.